Editor’s Note: Since our redesign in August of 2017, we’ve been spotlighting a drink every month in our Food & Drink section. Here’s a look back at every “Drink of the Month” since then. In the heat of summer, nothing cools like an artfully balanced tiki drink. At Hatch, the retro-cool slider slinger in Tustin’s Union Market, try Donn’s Dream (a Mai Tai-like ode to the legendary Donn Beach): Plantation Grande Reserve 5 and Flor de Caña 4 rums with a splash of Creole shrub and simple syrup. The Newport Beach restaurant ages the delicate Japanese Kikori Whiskey for several weeks in American oak barrels, with Luxardo cherries, demerara, Angostura bitters, and citrus. It’s then fine‑strained and—for the house Old-Fashioned—poured over hand-carved ice and garnished with an orange peel. 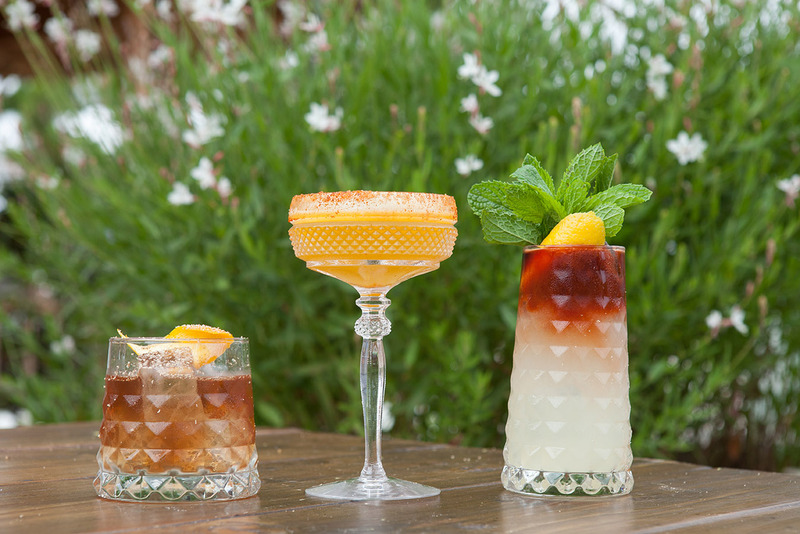 At this wooded, vintage cocktail den adjoined to Laguna Beach’s Driftwood Kitchen, High Tide pays homage to the Royal Hawaiian, a 1950s gin drink with pineapple juice and lemon. Here, it’s reimagined with Dickel No. 8 whiskey, pineapple juice, and punchy ginger puree. On just about any day, Santa Ana’s Vacation is the ideal getaway. The chic, leafy bar crafts its cocktails around a dozen global destinations. Take a trip to Tokyo with a verdant, refined drink of green tea, pear eau de vie, sake, peach Calpico (a Japanese soft drink), and aquafaba, the vegan answer to egg whites. Where most restaurants consider a partial liquor license a hindrance, Costa Mesa’s Pueblo uses it as inspiration. The typical beer-and-wine offerings are invigorated with unique vermouth cocktails that lean on classic Spanish flavors. Try the El Sabio, an easy-drinking highball of elderflower tonic, pear, and sweet vermouth. If you’re in need of a winter warmer, try this twist on the Old-Fashioned. The Brea restaurant infuses whiskey with a quick blast of hickory smoke and balances this with Luxardo Amaro Abano, a trio of bitters (Angostura, Peychaud’s, and orange), and a sweet bit of maple syrup. There are few bars as dramatic as The Blind Rabbit, a period playhouse of moody, retro kitsch. It’s perfect for cozying up with the sweet, warming sting of a Polynesian Kiss, with cognac, rye, apricot liqueur, grapefruit, lemon, raspberry, bitters, and a drift of cinnamon. But snag a reservation first. Social’s newest addition isn’t just a Costa Mesa destination for cold brew—go for all manner of unique coffee cocktails. The Cuban Mint Crisis plays on the tropics, with Kalani coconut liqueur, coconut water, Thunderking cold brew, lime cordial, and mint. It’s a mojito made for midday, sweet but with just enough boozy kick. A lighter, crisper alternative to beer, cider is having a moment. O.C. now boasts its first tasting room in Huntington Beach’s Tree Branch Cider House. As with any good tasting room, the tap list changes, but you can often find the pear-forward Shinko Perry. Look for more California craft ciders (and beer, too). Smokey The Bear at Farm & Culture Co.
SoCo’s kombucha specialist is on the cutting edge of cannabis, infusing some of its kombucha mocktails with the plant’s healthful CBD. Smokey The Bear has a double shot, plus an infused kombucha of smoky lapsang souchong tea—served on the rocks, garnished with a CBD gummy bear. A staple at Blinking Owl’s bar in Santa Ana, the Pink Moon is all about aquavit, an aromatic spirit infused with caraway, hibiscus, dill, and fennel. It’s paired with lemon juice, Angostura bitters, and falernum (an almond-and ginger-flavored syrup) for a refreshing, warm-weather winner. The Silly Rabbit is as memorable as they come: Arette tequila colored a brilliant orange by carrot-Thai chile syrup, enlivened with lemon and lime juice, and scented with clove and smoky mezcal. It’s naturally sweet with a prickly burn, a signature drink for this Santa Ana restaurant’s global menu. Yo Ho Ho and a Bottle of Rum is a fixture at this patio-dining favorite in Corona del Mar: a glug of aged rum, a buttery macadamia nut tincture, and a bit of sweet simple syrup. It’s a tiki drink for those who like their spirits neat and their pours stiff. For those warm late-summer days, try the Vietnamese sugar-cane juice called nuoc mia. Stylish newcomer Tropicane specializes in the stuff. Its OG Cane is as classic as it gets: sweet, refreshing sugar‑cane juice balanced with a tart shot of muddled kumquats and fresh kumquat juice.